Of all nineteenth-century painters, Cézanne has had the greatest influence on the major movements of modern art, from Cubism to Expressionism. A close contemporary of the leading French Impressionists, he strove to combine the lighter palette of these artists with a firmer rendering of form and space. 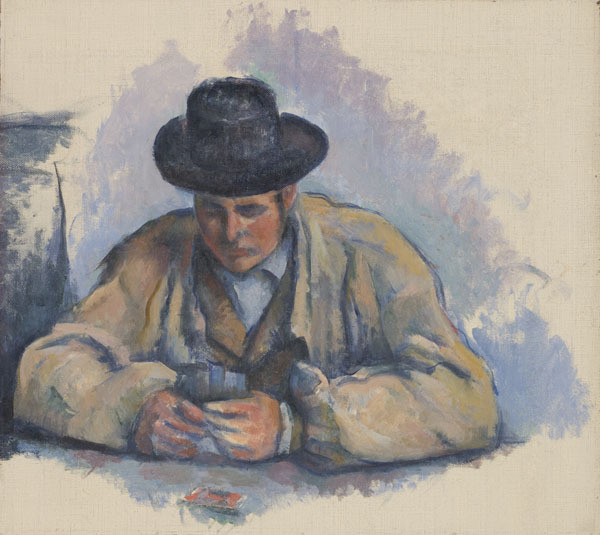 Cézanne, who "re-created nature" by utilizing color and considerable distortion of form to express the essence of his subjects, often painted the same theme many times. The Worcester canvas, one of a series of paintings depicting men engaged meditatively in a game of cards, is a study for a larger work consisting of three cardplayers (now at the Metropolitan Museum of Art, New York). Working with small brushstrokes, Cézanne built up a complex organization of planes of color that define form and space. The result is a sense of monumentality even in this simple subject.